Thanks to Globalisation , World is a Global Village now . Sitting in a small town in India one can place order for stuffs from other countries . For Apparels , Cosmetics , Books or other stuff’s it’s Okay but for food products it’s not good and is not a healthy option . 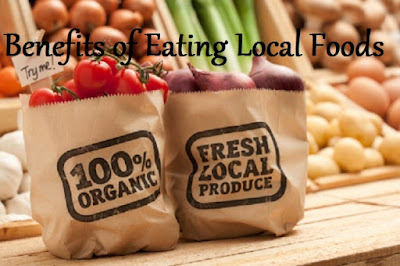 In today’s post I will discuss the benefit of eating local foods . 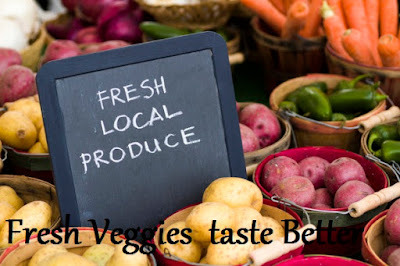 Local food is the food grown locally , in your area near to your city or town . Mostly from near by villages . Local food are allowed to ripen naturally , where as food that has to travel long distance are plucked before they ripe and are loaded with preservatives for longer shelf life . Fruits & Vegetables that we buy from local vendors are fresh with less preservatives . So local food retain more nutrients and are healthier. Since they are fresh they taste better than the ones transported from far off places . One can feel the natural flavor of these local foods . Specially seasonal fruits and vegetables taste good then preserved ones . Mangoes in Summer & Red Carrots in winters have a distinct taste which we can not get if we try the preserved ones in other seasons . Buying local food means less transportation and thus less air pollution . So they are boon to the environment . Buying local food supports farmers & vendors in our area and thus helps local economy . It’s like supporting you state & country and helping the economy , empowering local farmers and making their life better . They are safer as less preservatives are used . Chances of contamination while handling & transport is less . So these are the benefits of eating local foods . So by eating local food we are not only helping our economy and local farmers but also we are helping ourselves by eating healthier . The content herein is owned by the blogger . Superblogger2018 is not responsible for any kind of infringement caused .